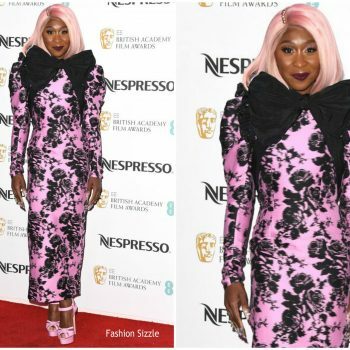 Cynthia Erivo attends the Nespresso British Academy Film Awards nominees party at Kensington Palace on February 9, 2019 in London, England. 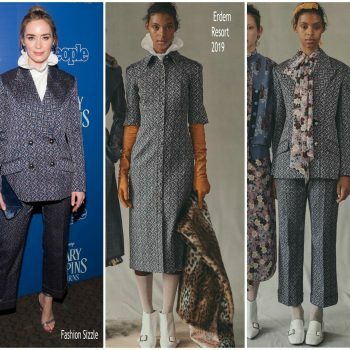 She is wearing Erdem Spring 2019. 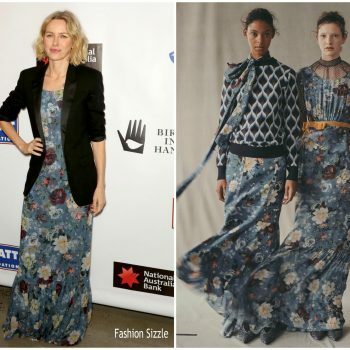 Naomi Watts attended the 2019 American Australian Arts Awards on Thursday (January 31) in New York City. 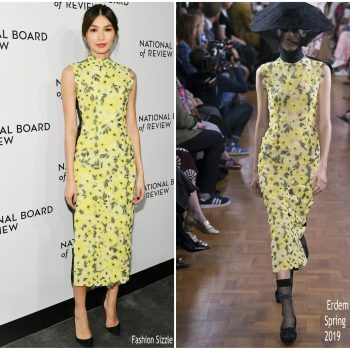 She wore an Erdem Resort 2019 dress. 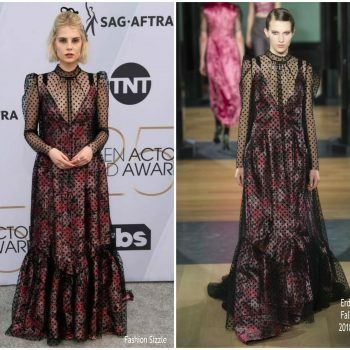 Lucy Boynton attended the 2019 SAG Awards on Sunday evening (January 27). 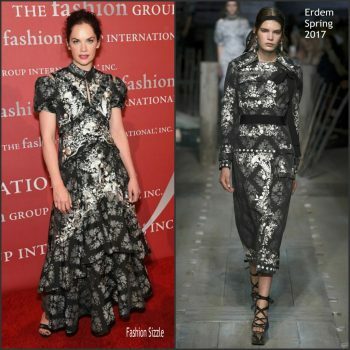 She wore an Erdem Fall 2018 gown. 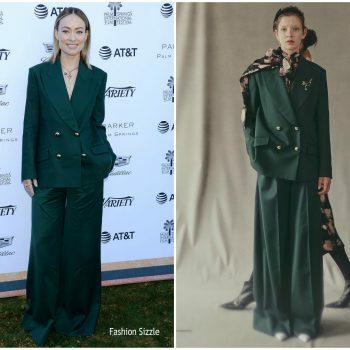 Olivia Wilde attended Variety’s Creative Impact Awards & 10 Directors to Watch Brunch at 2019 Palm Springs International Film Festival 01/04/2019 She wore a Erdem Resort 2019 suit. 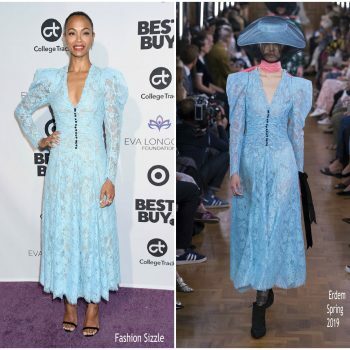 Kat Graham attended the Art Of Elysium ‘Heaven’ Gala on Saturday (January 5) in Los Angeles, California. 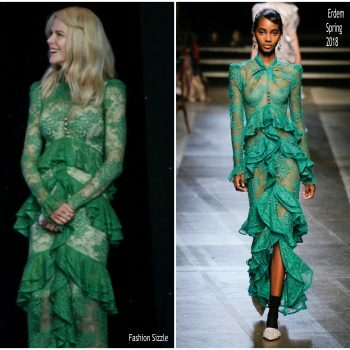 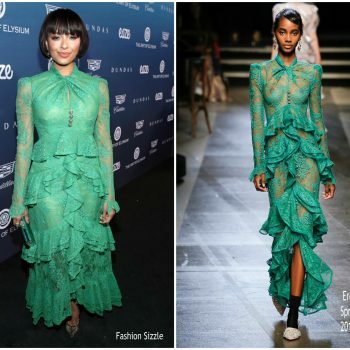 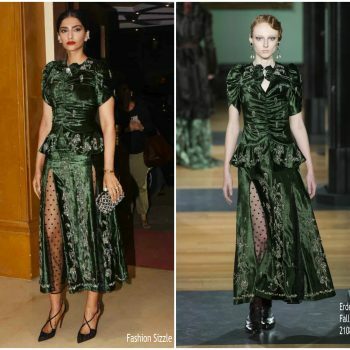 She wore a green Erdem Spring 2018 design. 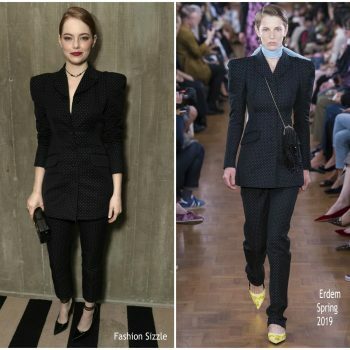 Emma Stone attended the Fox Searchlight Holiday Party November 17, 2018 She is wearing a black Erdem Spring 2019 suit styled with Louis Vuitton Call Back Pumps. 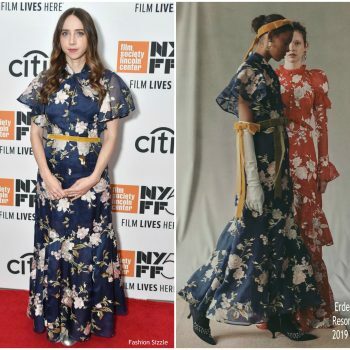 Zoe Kazan was in attendance during the New York Film Festival for the premiere of ‘Wildlife’ on Sunday (September 30). 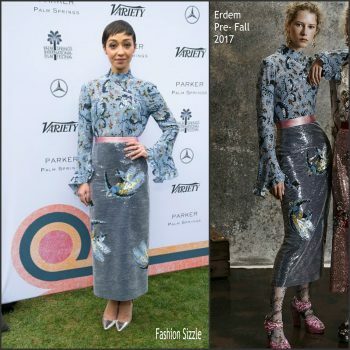 She wore an Erdem Resort 2019 design. 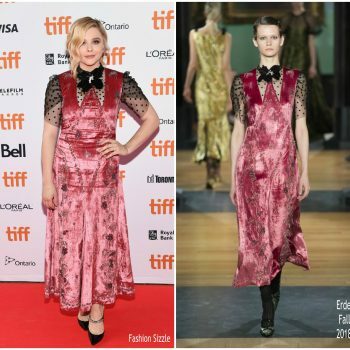 Chloe Grace Moretz attended the ‘Greta’ premiere during the 2018 Toronto International Film Festival on Thursday (September 6) Canada. 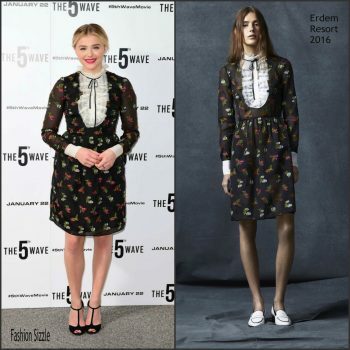 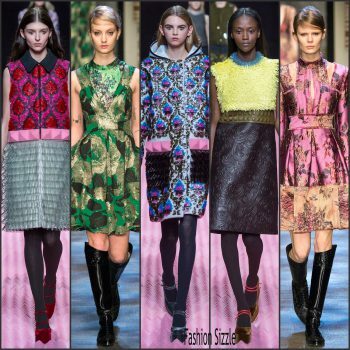 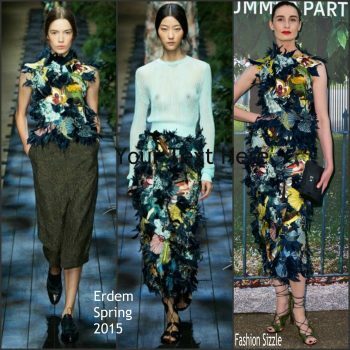 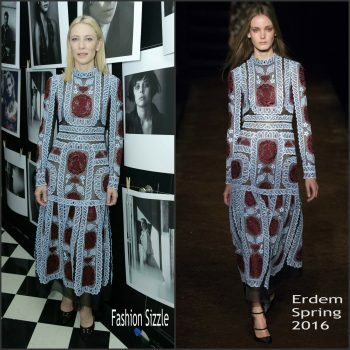 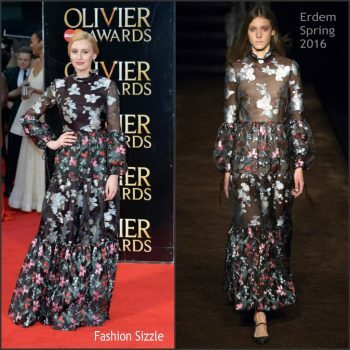 She wore a Erdem design. 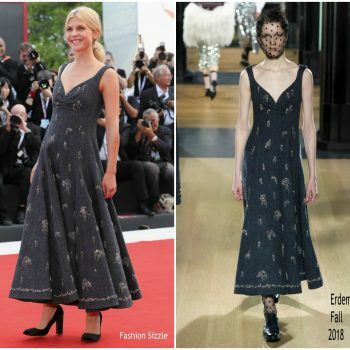 Clemence Poesy was in attendance at the opening ceremony and the ‘First Man’ premiere during the 2018 Venice Film Festival on (August 29) in Italy. 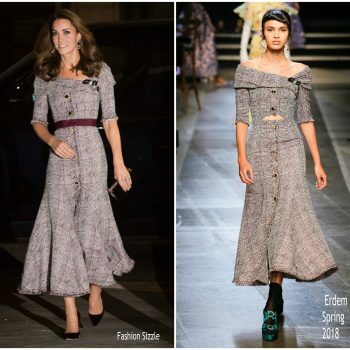 She wore a Erdem Fall 2018 dress. 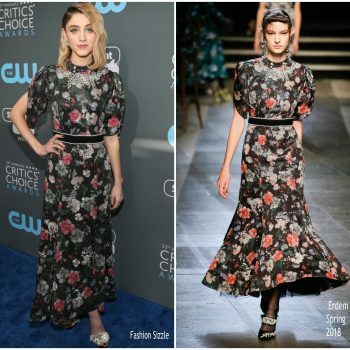 Denise Gough attends the The 63rd Annual Obie Awards at Terminal 5 on May 21, 2018 in New York City. 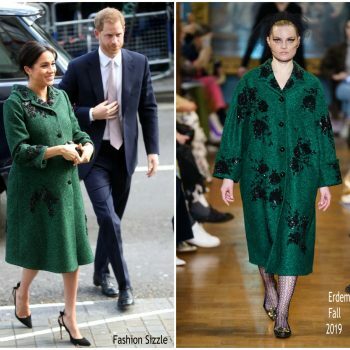 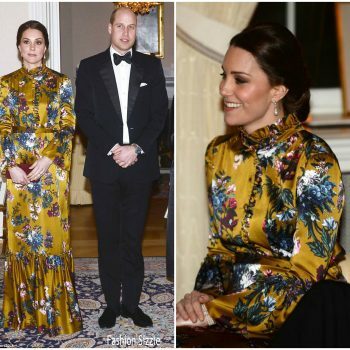 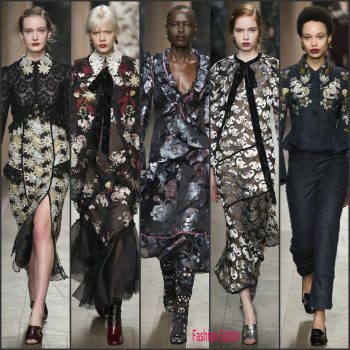 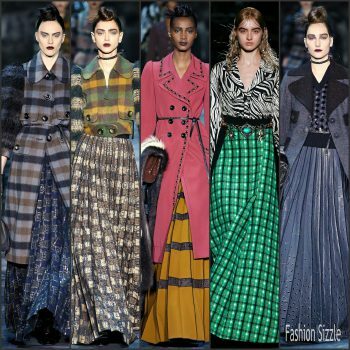 She wore a Erdem Fall 2018 design. 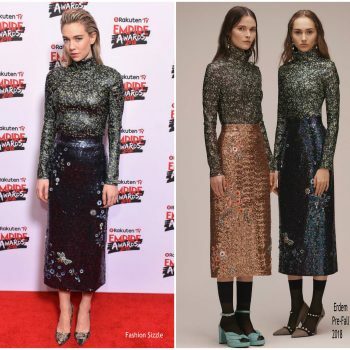 Vanessa Kirby was in attendance along with Daisy Ridley at the Rakuten TV EMPIRE Awards 2018 at The Roundhouse on March 18, 2018 in London, England. 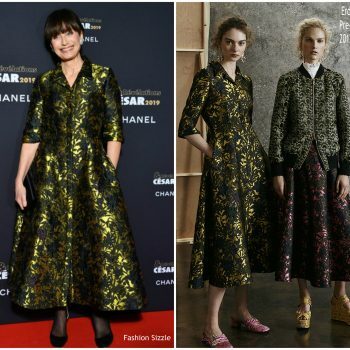 She is wearing an Erdem Pre-Fall 2018 design. 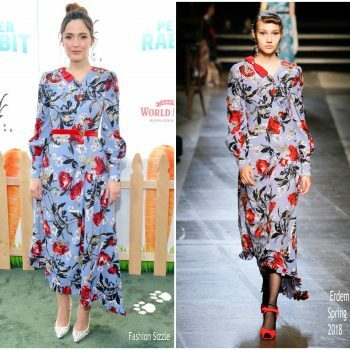 Elizabeth Debicki along with Margot Robbie attended the Aussie premiere of her movie Peter Rabbit on Saturday (March 17) in Sydney, Australia. 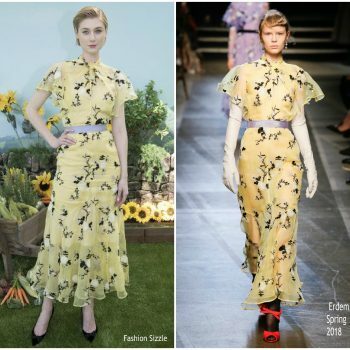 She is wearing a yellow print Erdem Spring 2018 dress. 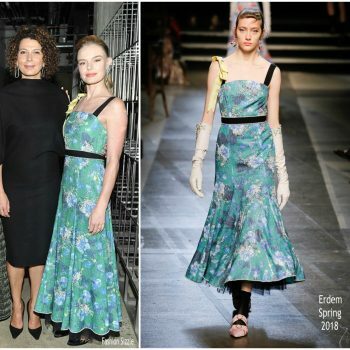 She is wearing a floral Erdem Spring 2018 dress. 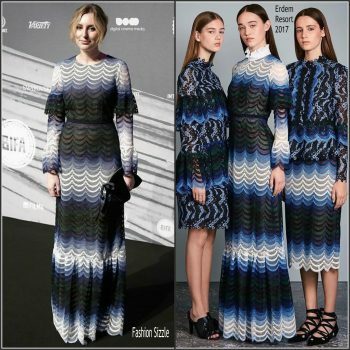 Nicole Kidman was in attendance at the Casting Society Of America’s 33rd Annual Artios Awards at The Beverly Hilton Hotel on Thursday (January 18) in Beverly Hills, California. 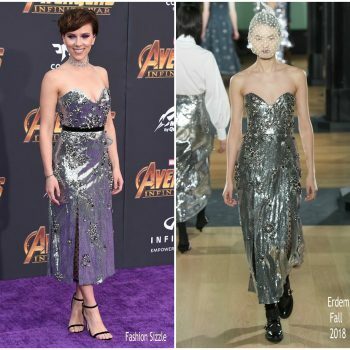 She was a presenter at the event. 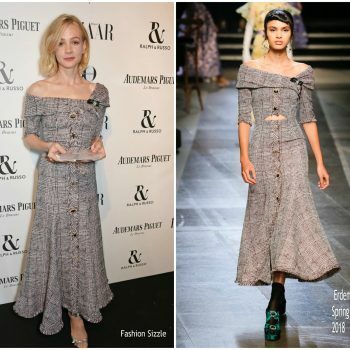 Andrea Riseborough attended The British Independent Film Awards held at Old Billingsgate on December 10, 2017 in London, England. 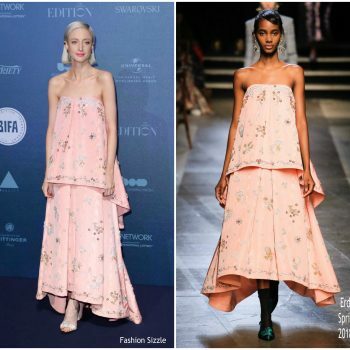 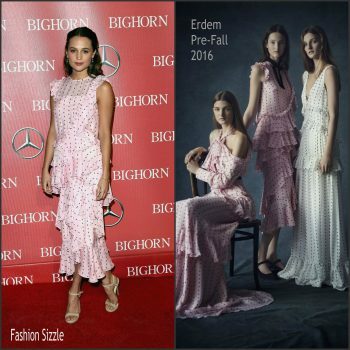 She wore a layered pink Erdem Spring 2018 embroidered gown. 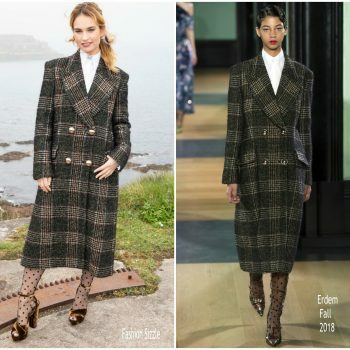 Kate Bosworth stopped by and made a guest appearance on ‘The Late Late Show with James Corden’ to promote her new film, ‘The Long Road Home’. 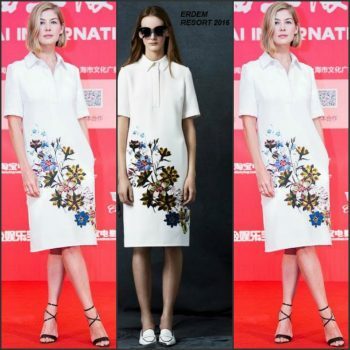 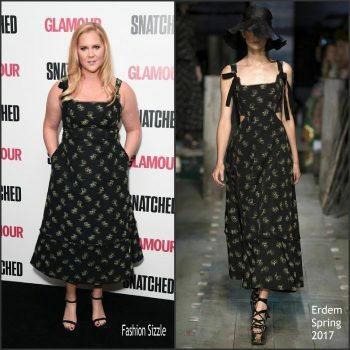 She wore a Erdem Spring 2018 design. 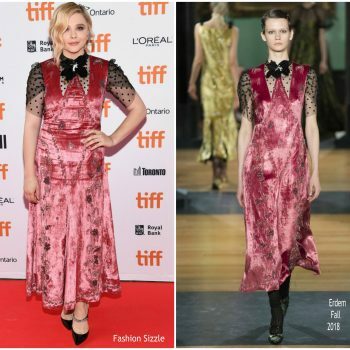 Lucy Boynton attended the ‘Murder On The Orient Express’ London world premiere on Thursday (November 2). 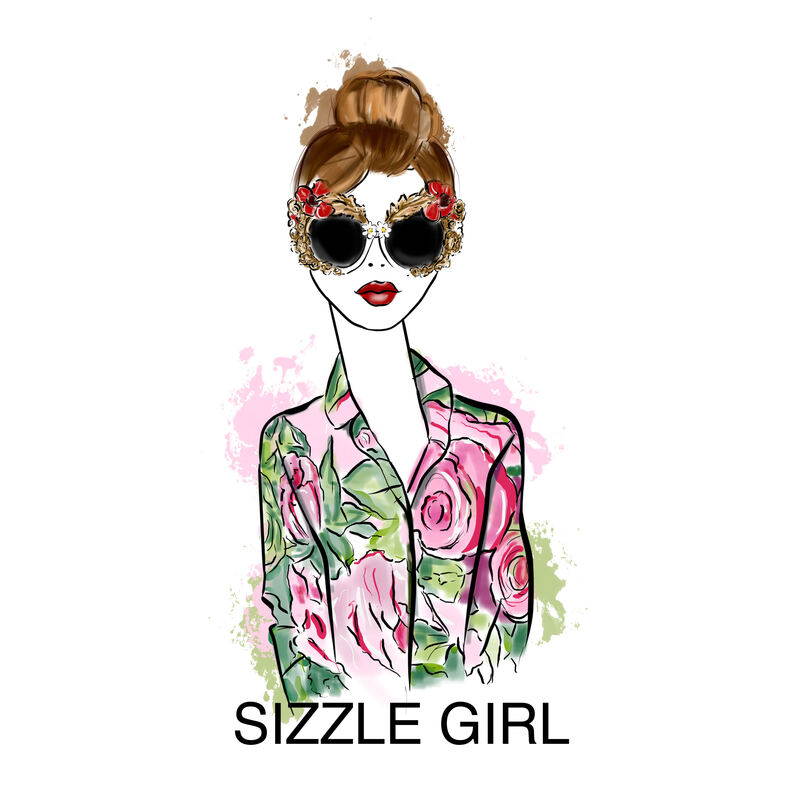 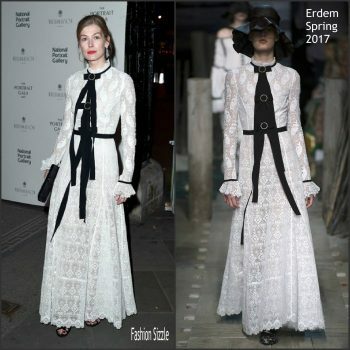 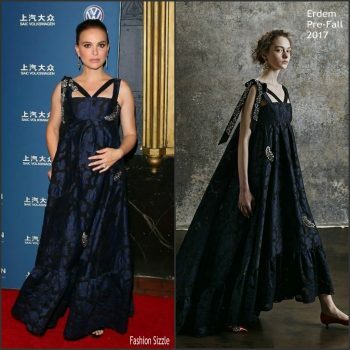 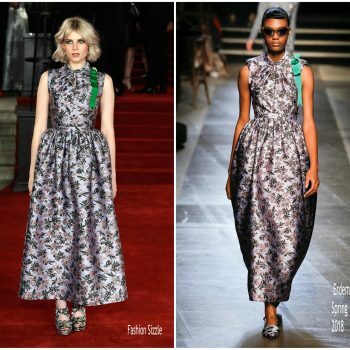 She wore a Erdem Spring 2018 collection. 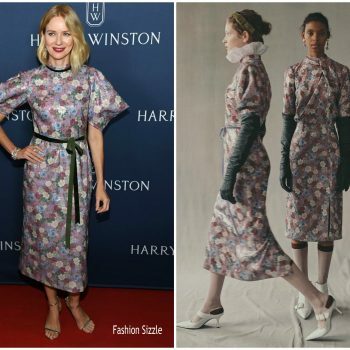 Kate Bosworth was in attendance at for the PORTER Incredible Women Gala on Wednesday (November 1) in Hollywood, California. 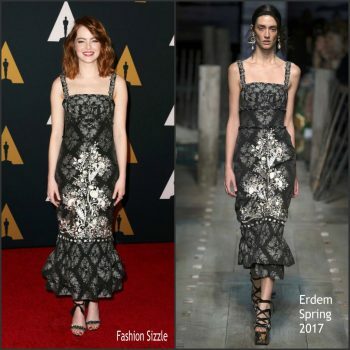 She wore an Erdem Spring 2018 dress. 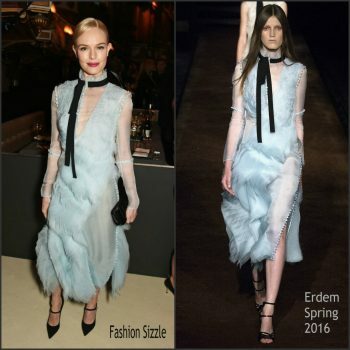 Stacy Martin attended The Serpentine Galleries Summer Party on Wednesday (June 28) in London England. 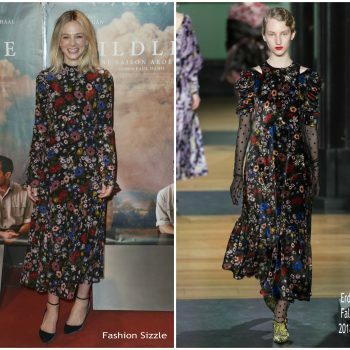 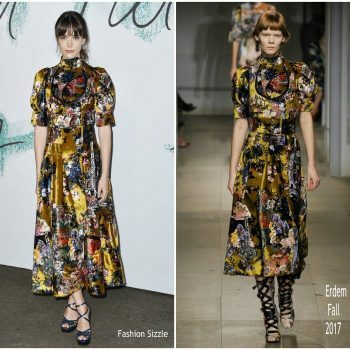 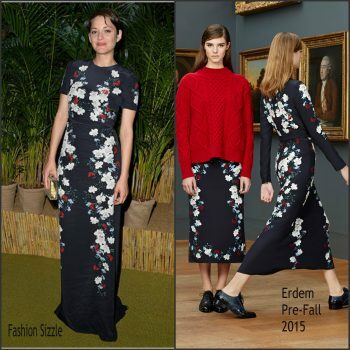 She wore a floral Erdem Fall 2017 dress. 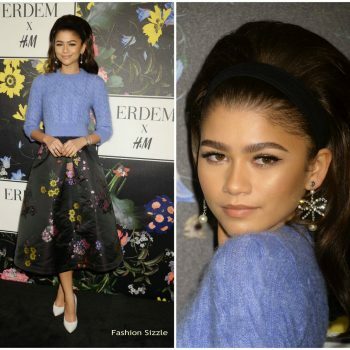 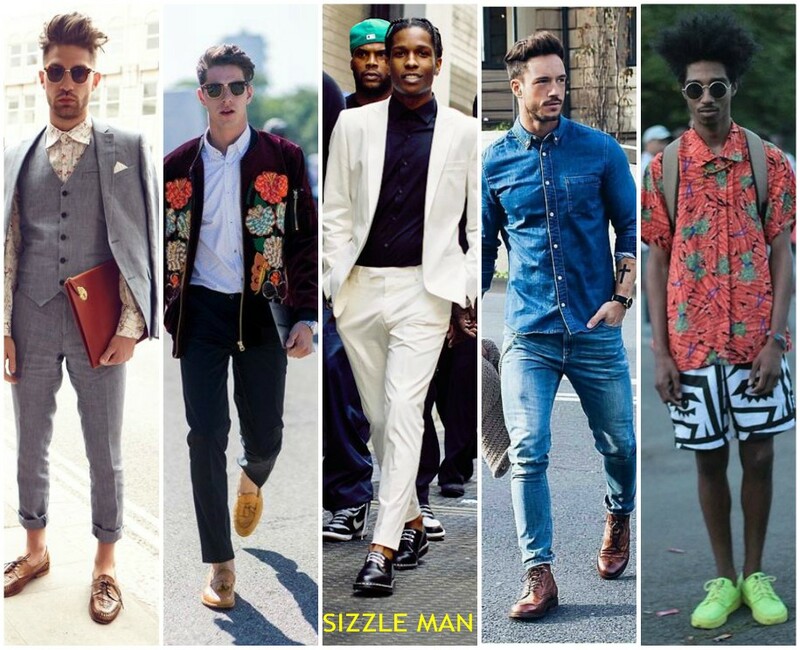 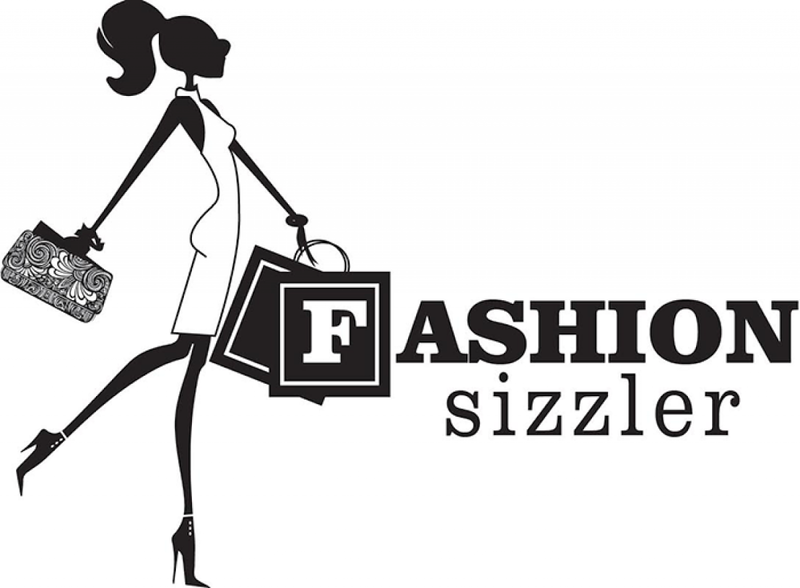 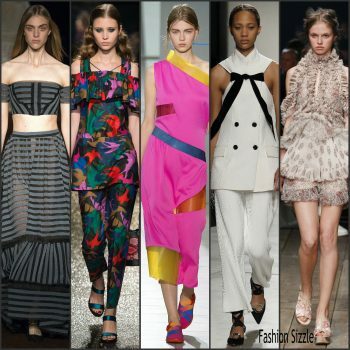 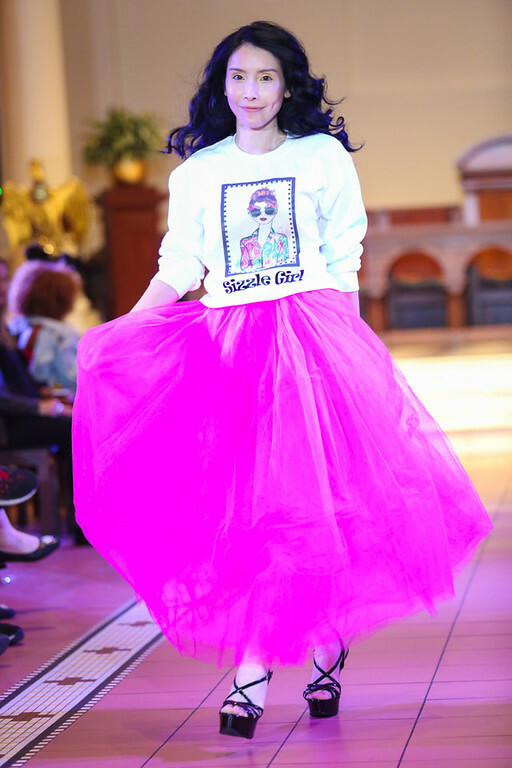 Her look was styled with Charlotte Mills ‘Elda’ heels. 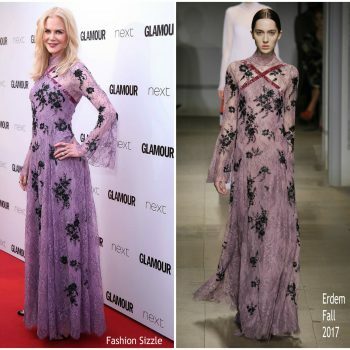 Nicole Kidman attended the Glamour Women of The Year Awards in London this evening (June 6) She wore a lace Erdem Fall 2017 dress . 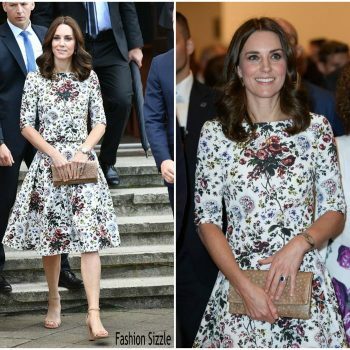 Pippa Middleton was spotted on her way to the ParaSnow Ball in London on Thursday (May 4). 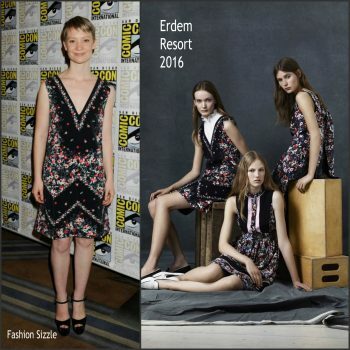 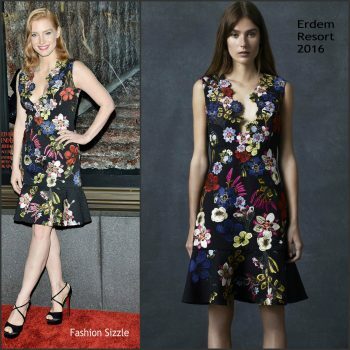 She is wearing a sleeveless Erdem Resort 2017 midi dress styled with Rupert Sanderson ‘Estelle’ heels. 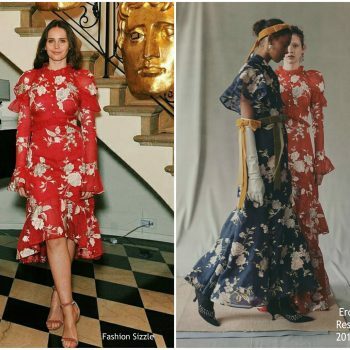 Felicity Jones was in attendance at the 2017 Met Gala held at the Metropolitan Museum of Art on Monday (May 1) in New York. 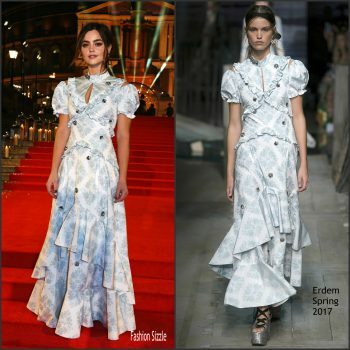 She wore a custom blue Erdem Fall 2017 embroidered gown . 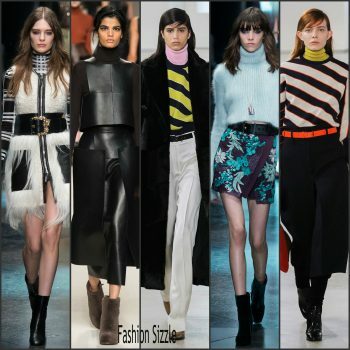 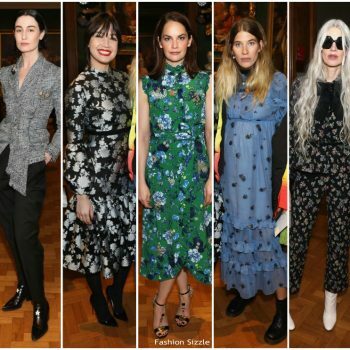 Elisa Sednaoui attended The Elisa Sednaoui Foundation event with Yoox Net-a-Porter held on Monday (March 28) in Milan, Italy. 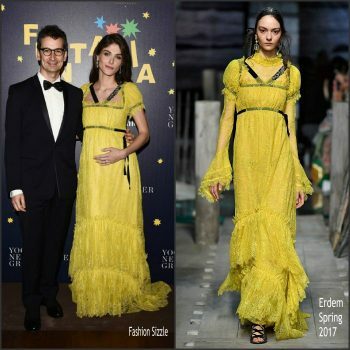 She wore a yellow Erdem Spring 2017 dress. 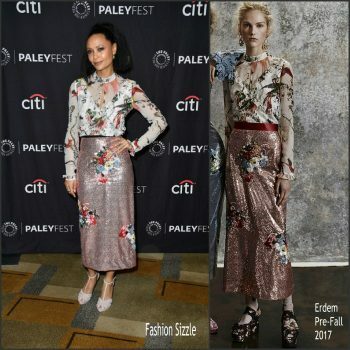 Thandie Newton attended the Westworld panel discussion on Saturday night (March 25) at the Paley Center For Media’s 2017 PaleyFest panel in Los Angeles. 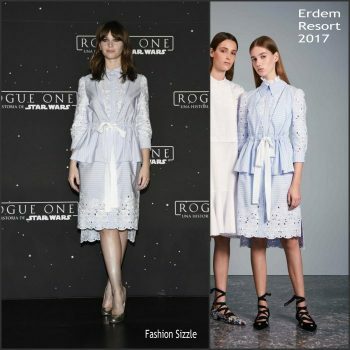 She is wearing a wore an Erdem Pre-Fall 2017 design. 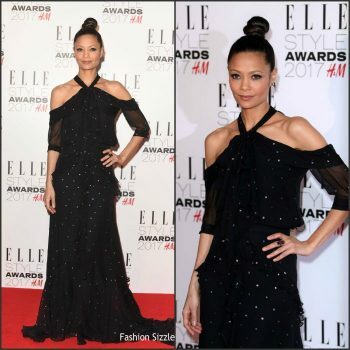 Thandie Newton attended the 2017 Elle Style Awards on Monday (February 13) in London. 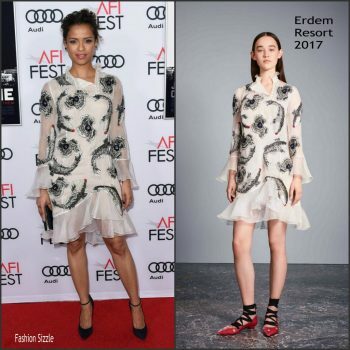 She wore a black halter Thandie’s two-piece Pre-Fall 2017 cold- shoulder gown. 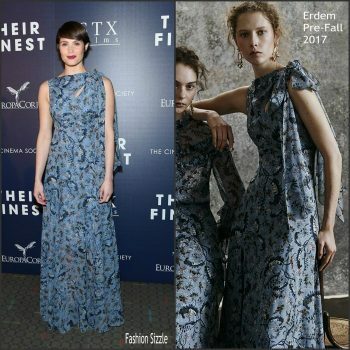 Claire Foy attended the 2017 Golden Globe Awards held at the Beverly Hilton Hotel on Sunday (January 8) in Beverly Hills, Calif She wore a custom Erdem Pre-Fall 2017 embellished v-neck gown. 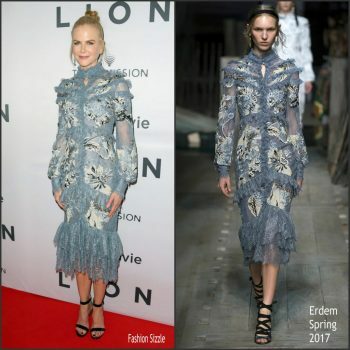 Nicole Kidman attended the Australian premiere of LION at State Theatre on December 19, 2016 in Sydney, Australia. 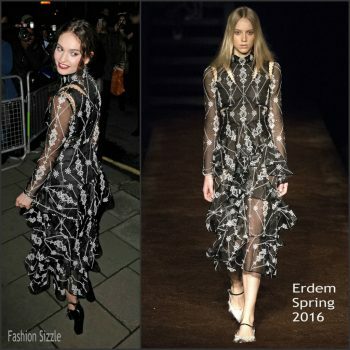 She is wearing a Erdem embroidered Long-Sleeve Dress with Lace Detailing from the Spring 2017 Collection. 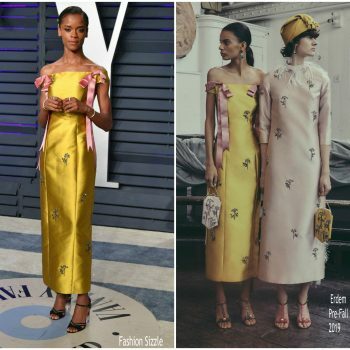 Emma Stone attended the 2016 Governors Awards on Saturday (November 12) at the Ray Dolby Ballroom in Hollywood. 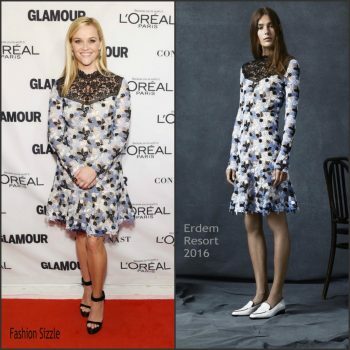 She wore an Erdem Spring 2017 jacquard midi flounce dress. 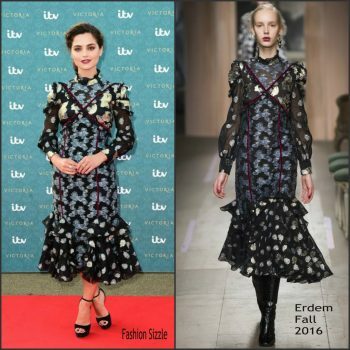 Jenna Coleman was in attendance at ITV`s world premiere of 'Victoria' at Kensington Palace in London on August 11 , 2016. 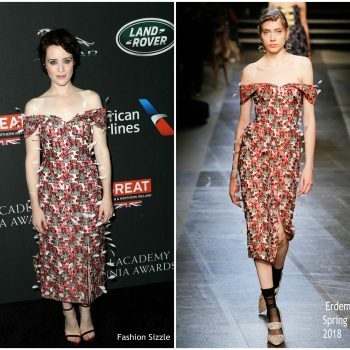 Bee Shaffer attends the 70th Annual Tony Awards at The Beacon Theatre on June 12, 2016 in New York City. 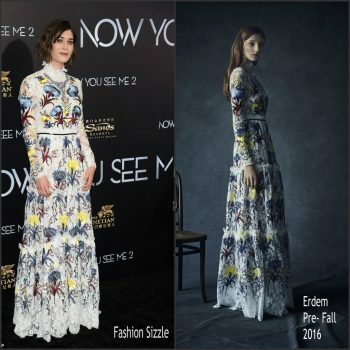 Lizzy Caplan attends the premiere of “Now You See Me 2” at the AMC Loews Lincoln Square 13 Theater in New York City. 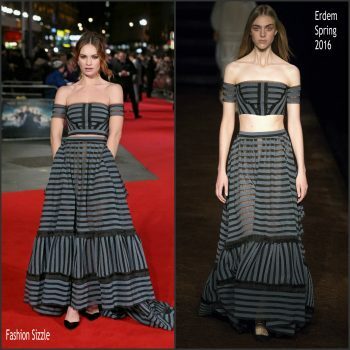 Emilia Clarke was in attendance at the Game of Thrones premiere at the TCL Chinese Theatre last night Hollywood, CA.